Today’s picture wasn’t supposed to be a shot of the outside of a public rest room, it was supposed to be a story of a man living in a “tolerated squat” in Paris. However, the tolerance clearly ran out. On the banks of the river Seine by the Pont Louis Philippe I had hoped to meet James B, A former French Foreign Legion soldier who took up near permanent residency in an old roadside utility storage space back in 1989. For more than twenty years James had called the 50 square metre space home, decorating it in a quirky style with found furniture and artefacts from his life and travels. For a modest fee James would show anyone around his humble abode and regale them with stories from his life and travels as a soldier, and a man who had come to live in this “tolerated squat” that looks across the river to the bell towers of Notre Dame. The mayor of Paris visited James on two occasions, granting him permission to connect to the cities electricity for free. In the summer, when the busy road that passes in front of his door is closed to make way for the Paris Plages (fake beaches), his home would become a pleasant ‘beach-front’ property. However, it was not so congenial in the cold winter months when the ceiling would leak and the room would occasionally flood. With no running water the residence wasn’t exactly an ideal home, but James used nearby public facilities and filled containers with water from any number of the public taps and Wallace Fountains that are all over the city. I had learned about James after doing a little research about the hidden and unusual things in Paris, so on this rather overcast summer day I thought it might be nice to meet the man who has lived at this interesting address for so long. Imagine my disappointment when I arrived to find that James’s ‘tolerated squat’ had been turned into a public rest room! I’ve tried to find information about James and where he might have moved to, but my search has drawn a blank. Using Google street view, it would seem that he was moved on some time between May and August 2014. The public restroom is very new, and in fact you can see city workers starting work on it using Google street view from April this year. On my wanderings around the city I did find another suspiciously inhabited old riverside tool shed. On the Île de la Cité at 22 promenade Maurice Carême, there’s a similar small room with two windows looking out onto the river. The address is just a few steps away from the doors of Notre Dame cathedral. Earlier this year I stood on tip toes and peered through the rather dusty windows and it very much looked inhabited to me. However, while I have found some information about that particular address, I don’t know if it’s where James is now living. 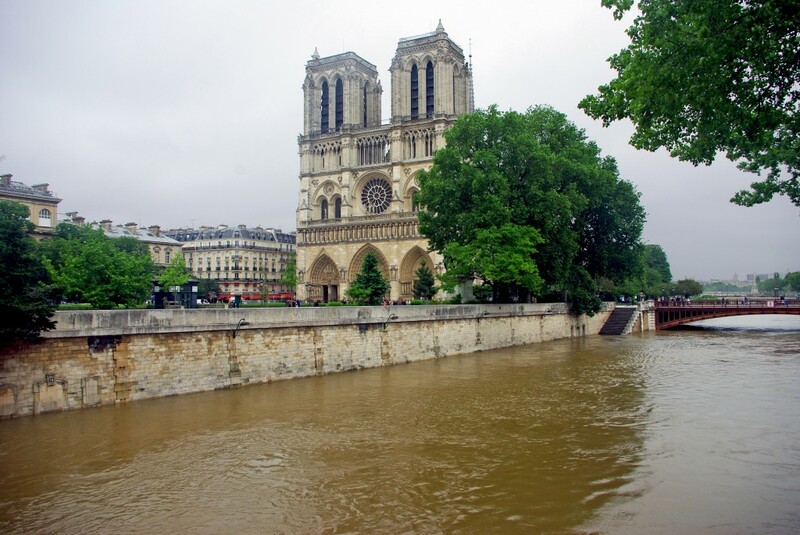 Even if it was, the floods that caused chaos across Paris in June, made that location uninhabitable. So today’s picture is a strange one, but maybe there’s a lesson here. Perhaps it would be; Sometimes in life we think we’re destined to find wonder, but we end up finding a toilet instead. It’s not a line you’ll be seeing on any inspirational posters, but hey, I never said it would be a poetic lesson!